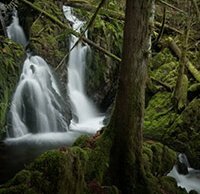 In the video below, we join photographer Adam Gibbs as he explores a new area on the east coast of Vancouver Island and also revisits a waterfall he photographed a few years prior. Waterfalls are a very interesting subject because there are many ways to approach them. It's common to see photographs stop down their lens and/or add a neutral density filter to be able to slow down the camera's shutter speed and turn the waterfall into a smooth, milky subject. On the other hand, you can use a faster shutter speed to capture the raw power of water. Depending on how you capture a waterfall, the feel of an image can be vastly different. Gibbs tries his hand at different shutter speeds and tries to figure out which works best for his selected location. The images featured in the video below were captured using a Nikon D850 with Nikon 16-35mm and 24-120mm f/4 lenses. His shutter speeds ranged from 4 seconds to 1/30 of a second. In all cases, he used a circular polarizer, which is basically a must-have tool for photographing water as it will allow you to reduce the reflections on the water's surface. Which of your images in the video above are your favorites? Do you like using a very slow shutter speed or a fast shutter speed when photographing waterfalls? Let us know in the comments below.